For this article, I will be using Canadian Dollars when discussing reward values measured by cents per mile (cpm), as Air Miles is a Canadian program. $64.84 CAD / 250 reward miles = 0.25936 CAD / mile, or 25.9 cents per mile (cpm). This is a great value as Air Miles redemption goes. I have observed air fare redemption come out to around 5.1 cpm, hotels to be around 9 cpm, and some events (such as Major League Soccer games, water park admissions) worth around 13 cpm, while Air Miles cash rewards are 10.5 cpm. I urge you to highly consider redeeming this reward as it has one of the best redemption values I’ve seen from Air miles. But do so soon as the supply is limited. The voucher will be mailed to you. So it is not instant. It says mailed within 3 weeks, but account for a potential Canada Post strike. 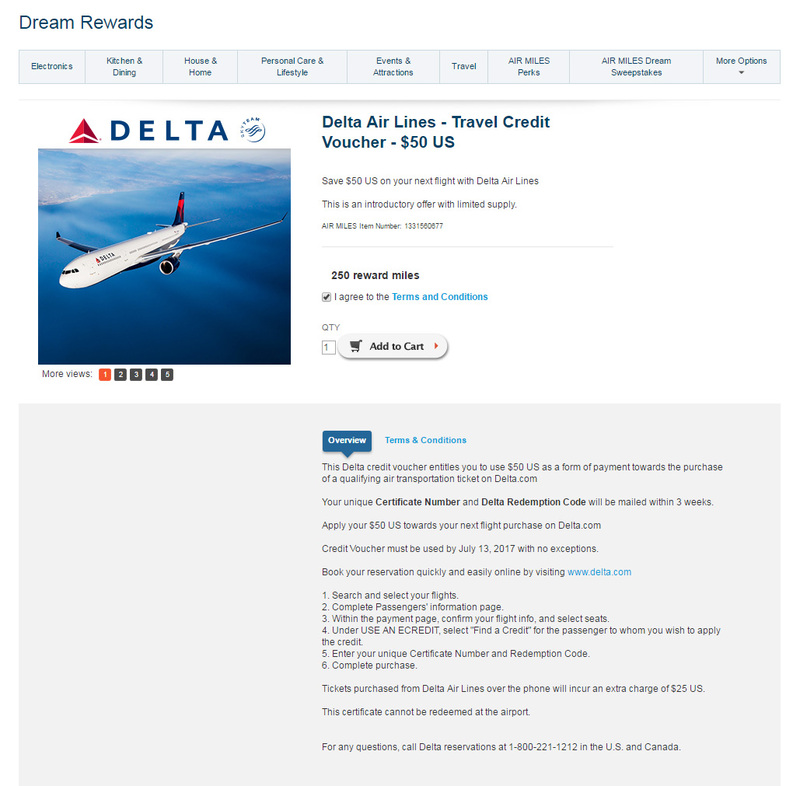 This voucher is to be used on Delta’s website, not Air Miles, so you don’t need to worry about paying Air Miles’ insane surcharges when booking travel. You can only order 1 voucher per transaction. I don’t see any restrictions on redeeming multiple vouchers from separate checkouts. There is a limit on how many vouchers you can combine per itinerary. See the product terms and conditions page, linked below. The voucher is in USD, but you can book with other currencies (Delta forces the currency to be your departure country) and the voucher’s value will automatically convert from USD. Booking via telephone will cost $25 USD, so you want to book online. You cannot use this voucher at an airport.